Above: My 2006 painting Eodroon featured on Dwell.com. Photo courtesy of Elko Weaver. 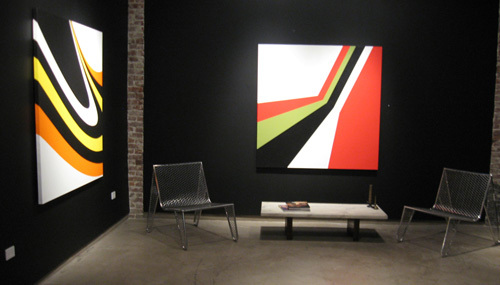 Images of my paintings on display at Thomas Hayes Gallery are now featured on Dwell.com, in a fantastic slideshow. See the accompanying article here. I am so happy right now, on a personal level and for the Thomas Hayes Gallery. The years of hard work are paying off. I’m very happy to share with you this set of images on flickr, which offer a glimpse of my current showing of hard edge art at Thomas Hayes Gallery in Hollywood, California. From left: Süfnex (2004) and Stryyka (2006), hung with a 1960s-era jacaranda coffee table, as well as stainless steel Inox chairs by Zanini de Zanine. I’m very happy to be showing at Thomas Hayes Gallery. I’m very impressed with how my work is displayed; my paintings really pop against the deep-space charcoal walls. 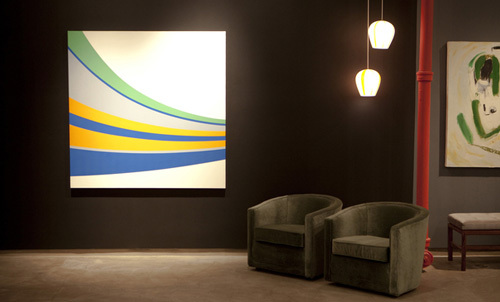 My minimal painting Orääänj is one of the first things you encounter as you enter the gallery from the street. Likewise, I am thrilled to be showing among works by John Barbour and June Harwood — legends of hard edge art. I invite you to check out my set of 14 photos from this show on flickr now.